• 24 Jun 2010 – TOAST congratulates Tote Board and Singapore Turf Club (STC) on the official opening of the STC Riding Centre (STCRC), an exciting milestone for the equestrian community. TOAST fully supports the idea of STCRC and has responded by making a newspaper advertisement sponsorship of $6,420 for the opening. TOAST with STC officials and STCRC riding instructor, Sarah Castricum (4th from right) at STCRC Opening Ceremony. • 10 Jun 2010 – Our TOAST President’s Reports from year 2005 to 2009 have been sent to the Singapore Turf Club (STC) senior management, Mr. Mike Wanklin, for their recognition of our feedback and directions for the betterment of our horse racing industry. • 4 Jun 2010 – Jockey A. John rode TOAST Trust No. 14 Horse, “Look At Me”, after a long break from riding of about 6 years. 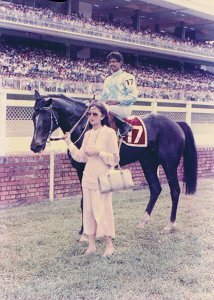 He has ridden 195 winners, including Cup Races like the 1988 Singapore Gold Cup, 1989 Singapore Derby, 1991 Tunku Gold Cup and 1998 Penang Governor’s Gold Cup. During his break, he took his time to build his fitness by riding trackwork and trials before making his comeback. TOAST wishes all the best in his future endeavours in his riding career. 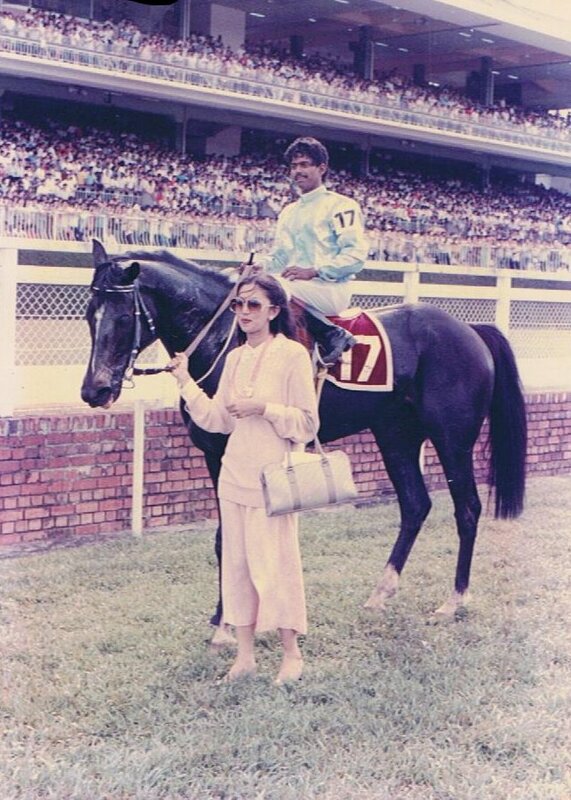 Jockey A. John on "Trend Defy" after winning the 1988 Singapore Gold Cup. • 16 May 2010 – During the SIA Cup race meeting, Dato Tan Chin Nam kindly offered to TOAST President, Ms Constance Cheng, to take a one-third partnership in all Think Big Stud bred horses purchased by Constance. Think Big Stud is Dato Tan's thoroughbred venture. 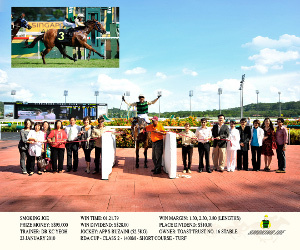 • 14-16 May 2010 – Visiting Jockey Ms Clare Lindop rode in the Singapore International Racing Festival 2010 on 14 and 16 May 2010 under the invitation and hospitality of TOAST President. Clare is a leading Adelaide Jockey who is a very strong rider and managed to get 3rd and 4th placing for both unready horses under Trainer Dr. Yeoh, Ten Ten Lai and Newfoundluck, respectively. She has over 650 winners, including 20 black-type races, in her 15 years of riding. 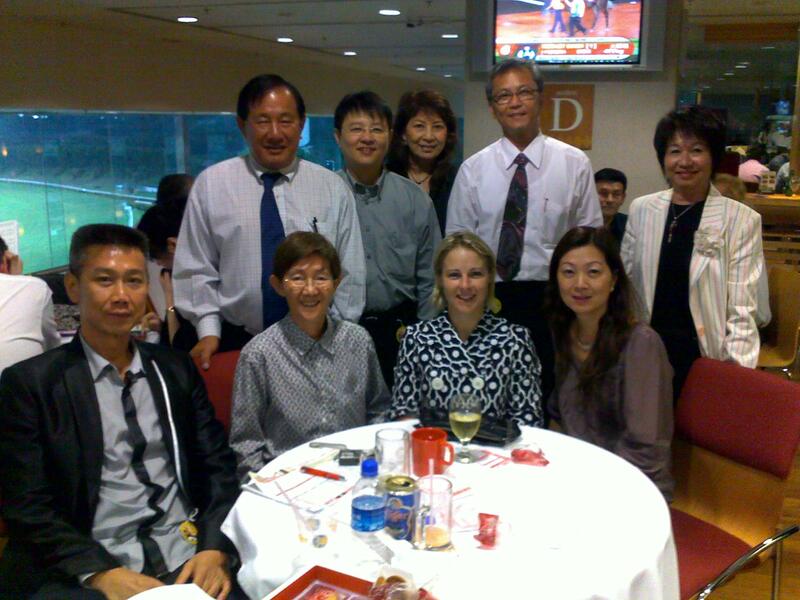 Jockey Clare Lindop (seated second from right) with TOAST President (right of Clare) and Treasurer (left of Clare), Trainer Dr Yeoh (standing extreme left), horse owners and friends at SIA Cup Race Day. 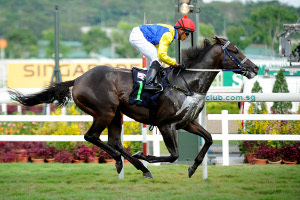 • 14 May 2010 – Singapore’s champion three-year-old "Better Than Ever", owned by Mr. Tang Weng Fei and other partners at Jupiter Stable, stretched his unbeaten run to 9 in scoring a soft victory in the Group 1 $500,000 Singapore Guineas (1600m). In winning the Singapore Guineas Silverware, "Better Than Ever" received a $150,000 bonus for Jupiter Stable in the three legs of the Singapore Three-Year-Old Challenge. The other two legs are Group 2 $350,000 Singapore Three-Year-Old Classic (1400m) on 18 April 2010 and Group 3 $250,000 Singapore Three-Year-Old Sprint Silverware (1200m) on 26 Mar 2010. "Better Than Ever" winning the 2010 Singapore Guineas. • 21 Apr 2010 – As a generous gesture extended by Mr. Hobart Low, Executive Director of Glaxis Travels, TOAST members are entitled to an offer of $100 travel for any travel package booked with Glaxis Travels. Travellers are also entitled to a lucky draw for a freehold condominium. For more details, TOAST members can contact Mr. Hobart Low directly at 98417557. • 17 Apr 2010 – Dato Tan Chin Nam lost “Viewed” and has to be put down after complications from a twisted bowl. A winner of 9 out of 36 starts, “Viewed” provided Dato Tan with his 4th Melbourne Cup success and Trainer Bert Cummings with his 12th Melbourne Cup success at odds of 40-1 in 2008. In 2009, the 6-year-old stormed home along the rails to win the BMW Caulfield Cup and became one of the few horses to claim 2 of Melbourne's famous cups. • 6 Apr 2010 – TOAST welcomes Mr. Raymond Wong Chin Teck of WONG THOMAS & LEONG to be the legal adviser of TOAST. Raymond was a member of the Bukit Timah Saddle Club and an avid rider when he was young. At the age of 15, he was granted a MARA licence, and he has a perfect record of one amateur race, one win. Due to family obligations, Raymond had to put aside for many years his passion for amateur horse racing, but he has now returned to contribute to the horse-racing fraternity. 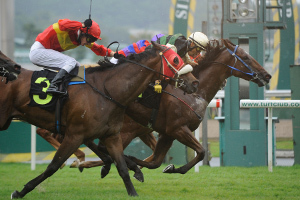 • 25 Mar 2010 – TOAST congratulates Michelle Mok to her first win on Fortune’s Gold over 1600m in New Zealand. Michelle, the daughter of our TOAST member Doreen Choo, has experience in working under Trainer Laurie Laxon, been an apprentice jockey in New Zealand, worked with breakers, racehorses and at stud farms, taken yearlings to the Karaka sales and worked for trainers Lionel Lee and ZL Mok when back in Singapore. She currently has the permit to train a maximum of 6 horses at any one time in New Zealand due to cheaper cost and time constraints (although she is qualified for the public Trainer’s License), while in the midst of obtaining a Bachelor of AgriScience (major in Equine Studies) at Massey University. She will graduate in about a year and a half and shows interests in training horses in Singapore. TOAST will be fully supportive of her return as a trainer in Singapore after her course. 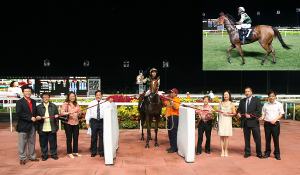 Michelle Mok on "Fortune's Gold", her first self-trained winner. • 21-22 Mar 2010 – TOAST President, Ms Constance Cheng, Vice President and Consultant, Mr. Bill Tan Tjo Teck went on Queensland for the Magic Millions Otis 6000 Yearling Sales. They were invited to the sale and the organizers bore the cost of business class air tickets, transport and accommodation. Ms Cheng bought 2 yearlings on her personal account, and together with others procured 2 yearlings for future TOAST Trusts. • 12 Mar 2010 – TOAST congratulates Mr. Tang Weng Fei and the other partners of Jupiter Stable on winning the Group 3 $200,000 1200m Merlion Trophy by “Mexican Rose”. "Mexican Rose" winning the 2010 Merlion Trophy. • 26 Feb 2010 – TOAST Trust No. 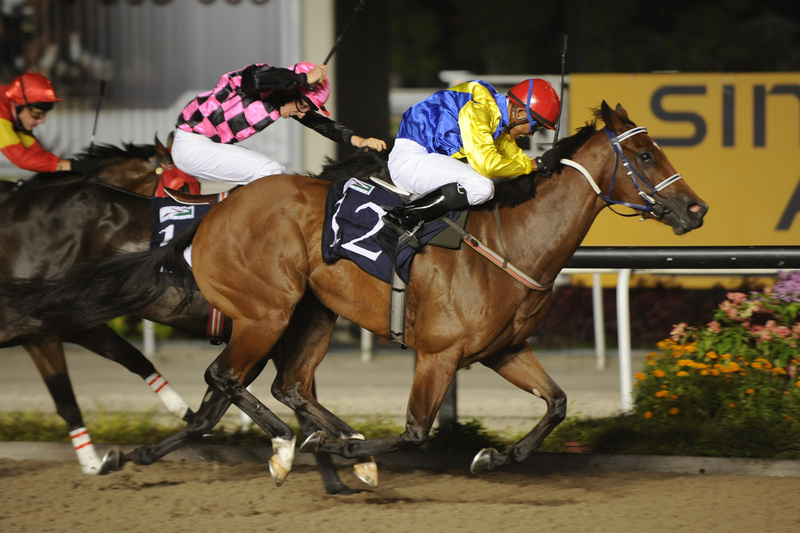 16, “Smoking Joe”, had another surprising victory in the $125,000 Kranji Stakes A (1400m). The Danetime five-year-old rushed home at the 300m under comeback Jockey Matthew Kellady to get the upperhand of the favourite Super Gold (Soo Khoon Beng) at the 100m before scoring by half-a-length from Sam Chua’s gallant galloper. “Smoking Joe” paid S$87 for a win and S$18 for a place on the tote. Third win for "Smoking Joe" on 26 Feb 2010. • 29 Jan 2010 – TOAST congratulates Teng Weng Fei and the other partners of Jupiter Stables for the win in the Group 3 $200,000 1400m Three Rings Trophy by “Better Than Ever”. • 23 Jan 2010 – TOAST and its president, Ms Constance Cheng, in her personal capacity donated $2,000 and $3,000 respectively for a $5,000 table to the Riding for Disabled Association (RDA) held at Singapore Turf Club. • 23 Jan 2010 – TOAST Trust No. 16, “Smoking Joe”, won the $95,000 Class 2 RDA Cup (1400m) journey in just 1 min 21.79 seconds, just 0.28 seconds outside the course record held by “Jabal Tarik”. The Tote paid S$28 for a Win and S$10 for a Place. Second win for "Smoking Joe" on 23 Jan 2010 in RDA Cup. • 3 Jan 2010 – TOAST Trust No. 16, “Smoking Joe”, beat the hot favourite “Lamborghini Flame” in $95,000 Class 2 (1400m). He came off a cozy rails position in 4th to overhaul “Lamborghini Flame” close home. The five-time winner favourite looked unbeatable when he surged forward at the 300m, but “Smoking Joe” (Oscar Chavez) produced the better kick inside the last 100m to get by a neck. “Smoking Joe” paid S$76 for a win and S$17 for a place on the tote. 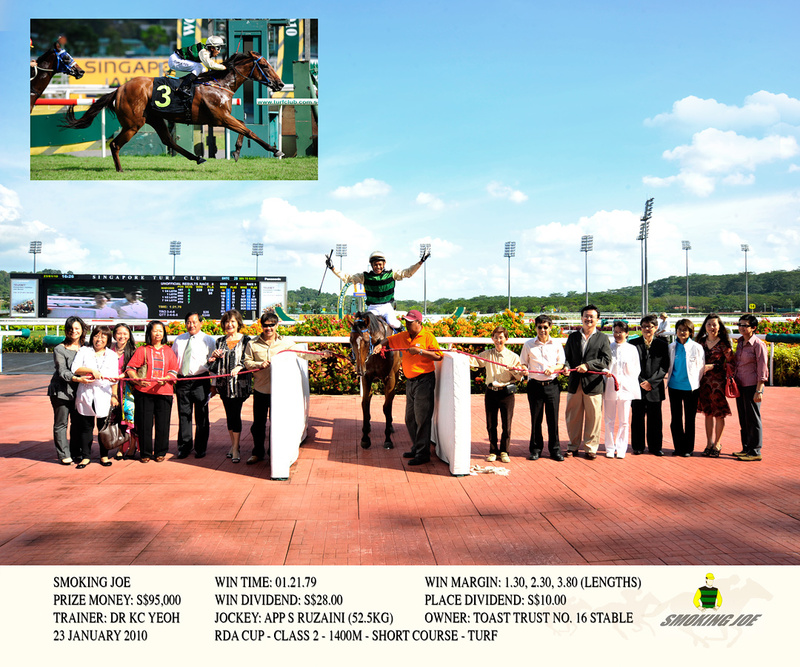 First win for "Smoking Joe" on 3 Jan 2010. • 1 Jan 2010 – TOAST congratulates Tang Weng Fei and his partners of Jupiter Stables in winning the Top Owner Stable 2009 Award. They are the proud owners of “Better Than Ever”, “Given Vision” and “Mexican Rose”. In the Winning Post article, Mr. Tang mentioned “I would really like to see some improvement in the training of local jockeys. But without a good foundation, our local jockeys will struggle. They need to set up a proper youth academy at the Club.” This is in line with TOAST’s opinion as we too support that idea.